Before you heard Ric Wilson, you might have retweeted him. Last year, the twenty-two-year-old rapper, artist, and prison abolitionist posted a mash-up of Earth, Wind & Fire’s “September” and Migos’s “Bad and Boujee,” set to footage from an old Soul Train performance. The result broke 2.8 million views on Twitter. The six tracks that follow consolidate Wilson’s (many) strengths. The synths bounce and uptalk (a la Soulection), calling to mind “Lost Soul” from his 2015 The Sun Was Out EP and Negrow Disco’s outstanding “everybodystay.” But from the lilt and swing of “Split” to the wistful minor drop in “Kiddie Cocktail,” BANBA tweaks with the formula to great effect. “I hate hi-hats—I feel like when people have creative blocks, they put hi-hats on a track [to] make it sound familiar to other people,” Wilson said, lifting a phone on and off the receiver and listening for the click it made. In the same spirit, BANBA employs sounds familiar (crumpled foil, chalk on a chalkboard) and strange (rewinds, bleeps, gulps and chirps). The result is equal parts Monte Booker and Timbaland: lavish, generous, imaginative. Rarely do Yo Gabba Gabba! and Quasimoto come to mind when describing a rapper—but when Wilson namedrops both on album centerpiece “Sinner,” you don’t doubt it for a moment. On the covers of Soul Bounce, Negrow Disco, and The Sun Was Out, Wilson gazed out from behind round-frame sunglasses, looking a little like the Hebru Brantley Flyboys he namechecked. On BANBA, he’s making eye contact, frames hanging from his right hand. Front and center. I was just listening to [your lyrics] on the title track—there’s “Black art not bad art,” which stands for itself, but also “Black art not sad art.” Could you talk about that? You know, Black art is just not this thing…Black artists don’t have to represent one emotion; Black artists can represent multiple emotions. How did the sound of BANBA come together? My friend Joey Hirsh, I met through a fellow engineer named Darwin from Classics Studios, and we clicked—not in real life, but virtually, on FaceTime, sending stuff back and forth. He really likes weird sounds; I really like weird sounds. But for BANBA, this project was a little different—I wanted a knock on every beat, so every beat has those weird sounds but also has 808s under it. Except “Love Away” has no drums, and there’s a reason for that. Could you tell us more about the cover of BANBA? The cover was inspired by Jean-Michel Basquiat—not a specific painting, but the specific pictures that Richard [Corman] took of him… I thought it was really cool to see this artist in front of all his work and just loved the setup. Also, a lot of the beats sound really abstract, because Basquiat kind of inspired the feel and vibe of most of the project. Who did the paintings on the cover? Julian Gilliam did the paintings, those are unreleased paintings by him that no one has ever seen before—except for on that picture. And they’re really good…Shout out to Julian. I think it’s cool that the glasses are off this time around. Yeah, yeah, and I had pictures with the glasses on—it was a decision. I kind of want people to see my face more, it’s a little more grown up, this project. And I’m just more comfortable with my face. Especially since I was just in this Bonobos commercial. I can’t believe I missed Kweku Collins in the ad! But he’s also on BANBA—how was it working with him? You also [talk about] Chicago multi-instrumentalist Sen Morimoto on that track. How did he get involved? Me and Sen been homies since 2014; he’s actually on Soul Bounce, too, playing sax. I like instruments a whole lot, I miss having instrumental parts in songs—I feel like Stevie Wonder’s really good at that, and he’s one of my favorite artists. I wanted to do that; I just hate having a bunch of vocal features for no reason…just let the song breathe a little, let people vibe out. In addition to being a rapper, you’re also an activist—would you call yourself an activist? No, not really “active”—but I’m a prison abolitionist. Well, you’ve done so many different things, including being a restorative justice researcher in Cambodia and South Korea. Tell us about being a prison abolitionist, what you do with it, and how it influences the music you do. Oh, man, so—prison abolition has become a more popular phrase than when I first heard of it. Mariame Kaba is a mentor of mine, and that’s where I first heard the phrase. I researched, read books—and a prison abolitionist is someone that wants to get at the root of everyone’s societal suffering. That’s what a prison abolitionist is—along with wanting to get rid of jails and prisons, and seeing things in a more transformative, restorative way. But it’s deeper than that, because you can get rid of [jails]…but what’s next? [As for] Cambodia and Korea—I got hired or accepted into this program to do restorative justice research in Cambodia, because of what happened with the Khmer Rouge genocide. We were living on the province, pretty much just getting a feel and asking folks questions—because folks that were part of the Khmer Rouge went back into the communities, the province areas, and we were just doing research on what that process was like. It seems like your interest in community activism has been as long as your interest in music. Yeah, it’s hand in hand. Is there any taste of that in the EP? Kind of. I think “BANBA” is the most political song, political quote-unquote. Every other song I’m talking about some more personal stuff. I also went through a breakup before the project, so—a little bit more personal. But there’s one sad song on the project, and that’s it. I never make any sad music. But there’s still some joy to it, even in the sad. Even when I think I’m sad it doesn’t sound sad! I can’t do sad music. But that probably rings true for some people who feel that way—their sadness doesn’t look the same as others’. Yeah, exactly! Sadness is complex. Emotions are complex. 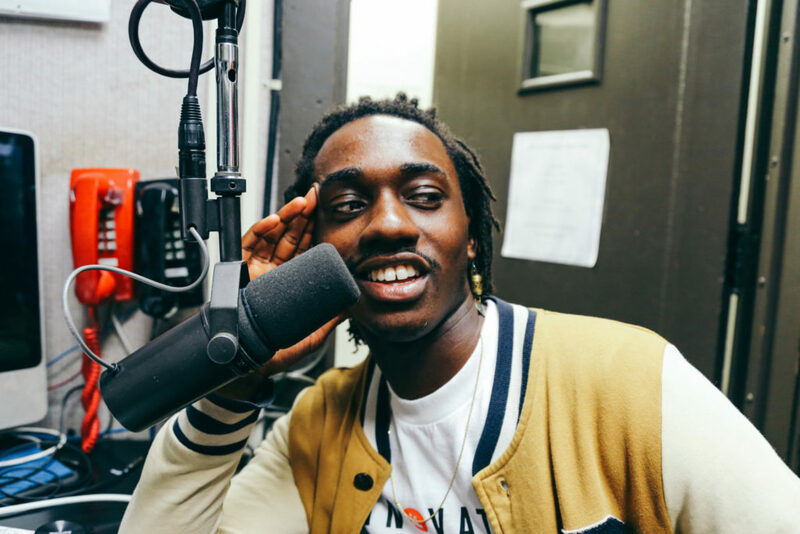 Ric Wilson will debut BANBA live at Lincoln Hall on June 2. He’ll also DJ as Disco Ric at Mamby on the Beach, June 23–24. Christopher Good is the Weekly’s music editor, and can be found with his headphones on. He last covered Daley’s Restaurant and its impending move across the street earlier this month. Olivia Obineme is a host of SSW Radio. Listen in on WHPK Tuesdays, 3pm–4pm. She last contributed an interview with The Chi creator Lena Waithe in March.